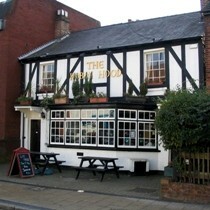 The Robin Hood in St Albans had three real ales, Adnams, Wadworth 6X and London Pride, available at the time of the review. Adnams seems to be regularly available whilst the other two handpumps can change. Prices seemed a little expensive but the bar staff were friendly. Seating is available at the front by the window or at the back where the long tables resembled a dining room. There's a pleasant small garden with around ten table benches at the rear. The music being played on the jukebox was actually quite good and consisted of mainly eighties pop and rock classics. This is a nice comfortable friendly pub with a decent choice of real ales and a good mix of people in the pub. Currently serving Flowers IPA, Timothy Taylor Landlord and Wadworths 6x real ales.